eTakeoff®, an electronic quantity takeoff product distributed by Sage, significantly increases accuracy, productivity, and speed over traditional paper or manual takeoff methods. 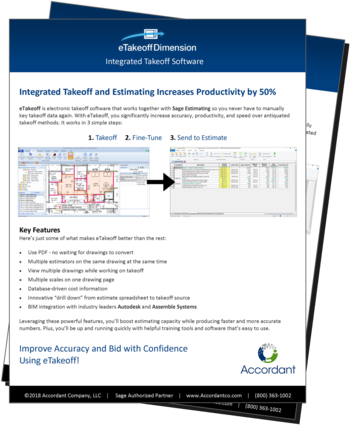 Powerful yet easy to use, eTakeoff provides estimators sophisticated assembly capabilities, extensive Microsoft® Excel integration, and time-saving features like Pattern Search, an auto-count symbol search feature that quickly locates and quantifies multiple occurrences of symbols within digital plans, to greatly improve the takeoff process. In addition to increasing your takeoff productivity, moving from paper to digital takeoff methods eliminates the hassle and cost of producing paper copies of plans during the bid phase. As a single copy of plans can cost hundreds of dollars to reproduce, you can quickly realize substantial cost savings when producing numerous bids. And digital plans allow for easy sharing and reviewing of all takeoff projects online rather than waiting for paper to circulate among your team. Become up to 15 times more productive than when using paper or manual takeoff methods. Have more time to analyze estimates and take on additional bids without increasing staffing. Measure to within a thousandth of an inch to take any guesstimates out of your bids. Easily highlight what you’ve already taken off to avoid potential mistakes and unforeseen project costs due to omissions. Provide takeoff history to automatically back up what was (and was not) included in the scope of your estimate to limit the potential for, or quickly resolve, disputes down the line. Easily compare new and previous drawings provided by architects to quickly see any changes that may or may not have been noted, preventing future issues that can impact a project or team relationships. Choose the version of eTakeoff best suited to your business, or mix and match dependent on the needs of each estimator on your team. eTakeoff Advanced includes an array of built-in features so you can get started quickly with very little training. eTakeoff Premier is designed for power users to customize nearly every function and integrate those into your current estimating process. As an estimator, you shouldn’t have to know the ins and outs of BIM design software to create production estimates from 3D models. Navisworks Integrator is an add-on to eTakeoff Bridge that puts model information into your hands. You can fully automate the transfer of 3D takeoff details, or do some things manually. It’s your choice. Click below to download our brochure to learn about key features and industry-leading capabilities to see if eTakeoff for Sage Estimating is the right fit for your company.